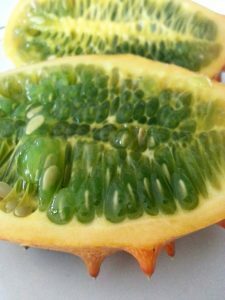 The kiwano (also known as a horned melon) is a fruit that originates from Africa and probably isn’t very well known, (or at least not in my part of the world at the moment)! The kiwano contains omega fatty acids and lots of antioxidants, and has a good amount of vitamin A, B vitamins, vitamin C, and vitamin E. It also contains calcium, iron, magnesium, manganese, phosphorus, potassium, and zinc. 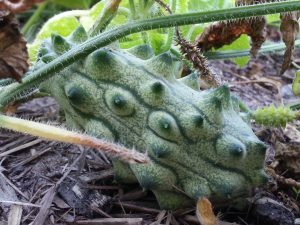 I’m lucky to have a kiwano plant growing in my garden (although I didn’t know what it was at the time)! The plant sprouted on its own from seed although I don’t know how the seed got there – maybe from falling bird poop, or it may have been dormant in the ground until I dug up the veggie patch (I may have moved the seed closer to the surface of the soil). 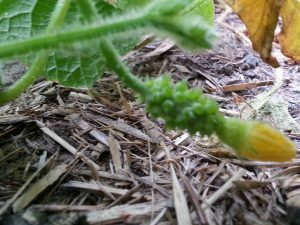 When I first noticed the sprouted plant, it was at the 2-leaf stage and looked like a zucchini plant. 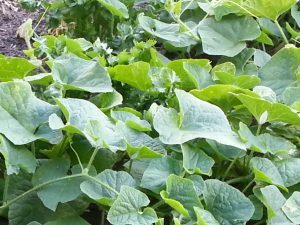 As more leaves emerged, it looked like a cucumber plant, but as it started to grow, I noticed that the leaves looked a little different to cucumber leaves; the leaves from this plant are heart-shaped. At that stage, I still had no idea what kind of plant it was. I decided to leave it alone and see if flowers would develop so that I could try to identify what kind of plant it was. The plant kept growing vigorously like a vine and started to take over the veggie patch (to the point where it was beginning to strangle my celery and beetroot plants!). I still didn’t see any flowers, so I decided to get rid of it. I took my gardening shears and started pruning the plant, and then I noticed very tiny unopened yellow flowers hidden underneath the leaves. Attached to each flower was a very tiny green fruit that looked like a miniature pineapple – it was smaller than a fingernail! I decided to leave the plant alone and, over time, the fruit started to grow. They were green, and covered in very sharp spikes! As they started to ripen, they began to turn yellow and, then they changed to a very deep orange colour (this is when they’re ripe). The best way to cut a kiwano is to cut it in half along the length of the fruit. The inside green pulp and the cucumber-looking seeds are the edible part of the fruit. The seeds are enclosed in a green gel-like sac. 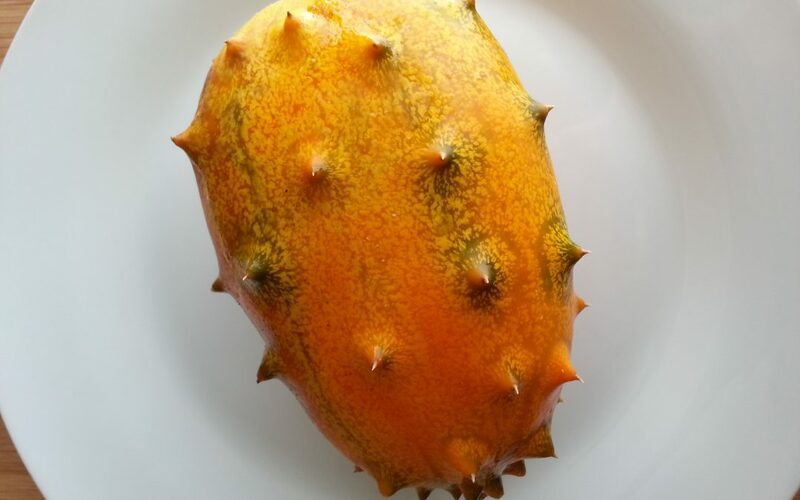 The best way to eat a kiwano is by scooping out the pulp into a bowl. 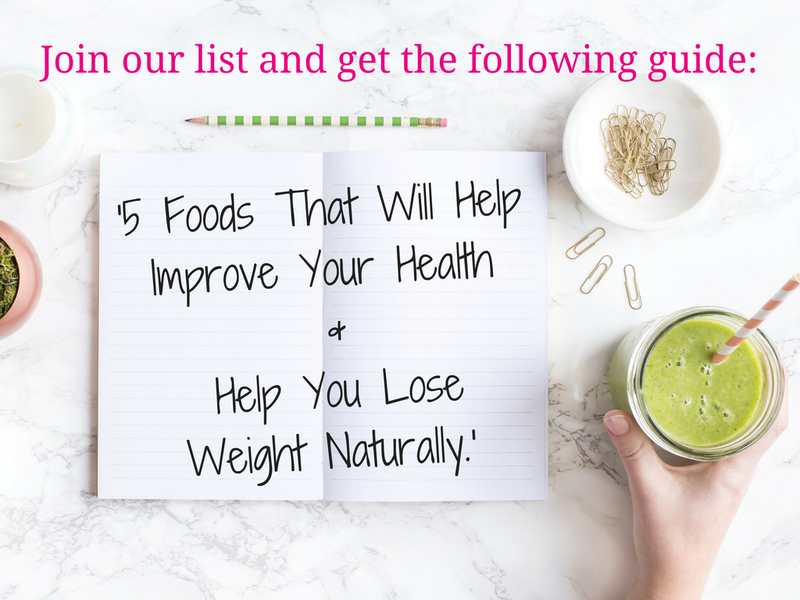 You can eat it on it’s own, or use it in the same way that you would use passionfruit pulp. I don’t chew the seeds; in the same way that I don’t chew on passionfruit seeds. The kiwano isn’t very sweet and it has a very mild banana flavour (when bananas are just starting to ripen).